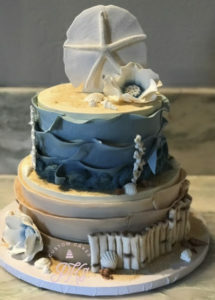 PKs Custom Cakes is located in Arroyo Grande, California. We serve all of San Luis Obispo County with our custom decorated birthday cakes, wedding cakes, and more! All wedding cakes are homemade and organic with gluten-free options. 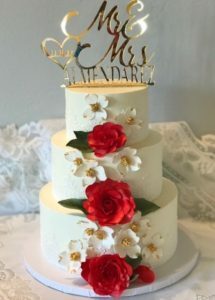 Wedding cake pricing begins at $6.00 per serving for single tiered cutting cakes and increases depending on the number of tiers, size, and decoration complexity of the cake. I also offer side cakes (please call or contact us for pricing). See cake photos below for pricing examples. I offer a variety of cake sizes to fit your needs! 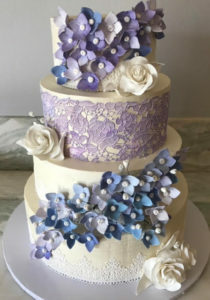 All wedding cake pricing includes moderate decorations, (3-7 larger sugar flowers, depending on cake size, additional or more complex sugar flowers are charged accordingly). Wedding cake tasting appointments are available. This includes cake flavors and fillings that have been made that week. There is a $25 fee for tasting appointments which last about 45 minutes. All cupcakes are homemade and organic with gluten-free options. All cakes are homemade and organic with gluten-free options. The prices below include a double layer cake, filled, and moderately custom decorated. If you don’t see a flavor you like just ask! I can accommodate most flavors. I create realistic sugar flowers and succulents crafted from sugar and frosting that melt in your mouth. I was trained by the world-class wedding cake designer, Paul Bradford. Along with taking his online classes, I also attended Paul Bradford Sugarcraft School for a 5-day advanced course in Scotland where I received my certification. I am always continuing my education to keep up with the latest techniques and trends. Custom cakes are just that, custom-made cakes. From handmade intricate sugar flowers to the cake itself that is all homemade from scratch, using organic unprocessed ingredients. Wedding cake designs are digitally sketched for clients, as well as for larger all occasion cakes. Costs of all natural ingredients used at PKs, are higher in price than pre-made ingredients purchased in bulk. 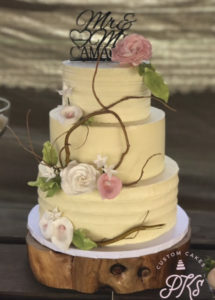 Custom cakes have the “personal” touch, with regular communication with wedding client, photos of flowers in the process, digital sketch with revision, as well as decoration color matching, attention to detail, and excellent homemade cake taste. 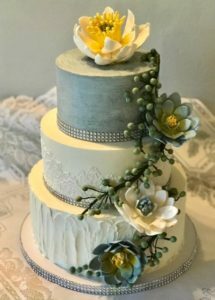 As a custom cake decorator out of my home, I design and create each cake individually myself which takes many hours for larger cakes, and moderate hours for smaller ones. 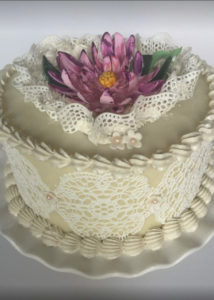 Each cake (except for the 6“), “includes” a certain number of sugar flowers for the price stated, (or equivalent decoration). I hope you will give a PKs Custom Cakes a try, you can see and taste the difference. I know you won’t be disappointed! PKs has many very satisfied clients. I work with all budgets and can usually work out a design and price to meet client’s needs for a custom cake! However, custom cakes by their very nature cannot accommodate minimal pricing.